Chances are that you had to really put your brakes to work to stay safe this past winter. So now is the time to look over every part of your brake lines, hoses, and the fluid levels. Brakes will always be at the top of the list of your truck maintenance because they are vital to keeping you and other drivers safe on the road. Your truck’s tire pressure is a key part of safety, fuel efficiency, and handling for your vehicle. All of the temperature changes tend to fluctuate your tire’s air pressure. Driving can become dangerous if your tires aren’t inflated correctly. Avoid long term damage to your wheels by making sure that your tire pressure is at the proper level. Another part of your truck that winter can do a number on is your suspension. Check the shocks and struts on your truck for any signs of damage. You want to make sure that you and the freight you are carrying remain safe and secure. The harsh jostling from uneven roads, potholes and ice are likely to have beaten up your suspension a lot. Generally speaking, you will always want to make sure that your hose and belt are no more than five years old. But the cold weather can make them age and wear down much quicker. When in doubt, it’s better to replace them. Lastly, make sure to check on your truck’s batteries and electrical wires. Test the battery terminals, plugs and wiring for signs of wear or damage. The last thing you need is to have your battery die at the beginning of the new season. 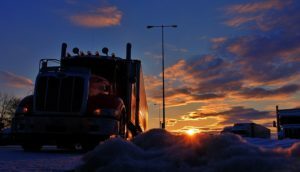 This entry was posted on Monday, March 25th, 2019	at 8:32 pm	and is filed under Trucking Lifestyle	. You can follow any responses to this entry through the RSS 2.0	feed. Both comments and pings are currently closed.